New research into the reproductive behaviour of one of New Zealand's most mysterious and unusual insects – the cave weta – shows that the male weta's distinctively-elongated hind legs play a vital role in ensuring mating success. 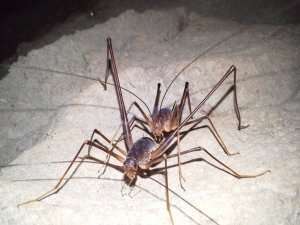 The study, by University of Auckland PhD candidate Murray Fea and Associate Professor Greg Holwell from the School of Biological Sciences, reveals that the long hind legs of the male effectively shield females during mating so that other cave inhabitants can't interrupt proceedings. "Having a female flee due to contact with a nuisance neighbour can be fatal to the male's chances; he may never find her again in the pitch darkness," Mr Fea says. Cave wetas (Pachyrhamma waitomoensis) are nocturnal scavengers which retreat into caves during the day, clustering in groups. If left undisturbed, weta pairs can stay together for many hours and copulate many times over long periods of the day. The longest pairing time for a single pair observed in this study was 11.7 hours. The research team used video recordings of weta behaviour in the large populations that live in the limestone karst caves at Waitomo. Scientists study the exaggerated adaptations of different species in order to better understand how sexual selection has favoured some traits over others. Many animals have distinctively exaggerated traits but more often these adaptations are used to fight off rival males. "Cave weta have barely been studied since the 1960s despite their fascinating biology and behaviour; they really are one of New Zealand's most extraordinary species," Mr Fea says. "The behaviour of the male weta is one of the very few examples we see in nature where the exaggerated anatomical structure of a species, in this case elongated legs, is used to directly shield a mate during copulation."